Its 8.00am and I have just arrived at work. Time for a quick cuppa before the trip to Dogs Trust Loughborough with a very stressed two year old Staffordshire Bull Terrier cross called Tiger. Tiger came to us from a dog warden in Wales, and has been with us for a couple of months now. He is not coping as well as we'd like, so he is going to spend some time with the behaviour team there as they have some kennel space that should suit him. By noon, I’m just setting off to come back to Kenilworth. I have just spent the last hour with Tiger and a couple of staff who will be looking after him full time. The staff seem very enthusiastic which is great to see. Being a newer centre, they have a slightly bigger space for him, and some climbing equipment that may prove a challenge, and a quieter environment which should help soothe his stress. 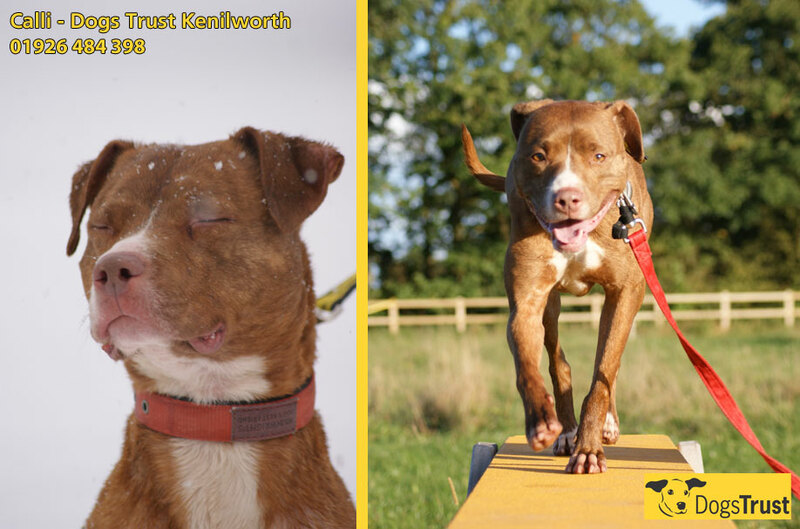 Enriching a dog's environment is so important to their welfare, and we'll be keeping a close eye on Tiger's progress to help him find his way to that new home for life. Now back at Kenilworth, I can share some information about three of our wonderful residents all looking for a permanent home of their own. Introducing Calli, Raphry and Sky! You don't have to make an appointment to drop in and see us during opening hours (12noon - 4pm every day except Fridays, when we're closed for staff training), but you can give us a ring on 01926 484 398 if you have any questions. Calli is a 6yr old Staffordshire Bull Terrier cross. Through no fault of her own, this is not the first time she's been in our care, and we'd really like to see her settled for life. She is extremely stressed in kennels and is struggling to cope. When she does settle she is a very affectionate and playful girl. Her previous home record says she lived with three very young children, but because she is a bit of a worrier, we feel she would be better suited to live with children not much younger than 8 years old. She is housetrained, can cope being on her own for a few hours, not bad at travelling and will need to be the only pet. 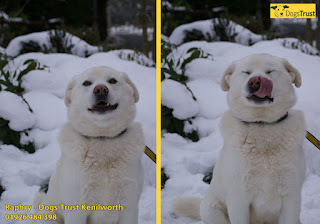 Raphry is a 4yr old Samoyed x. He came into the centre at the beginning of the year. We have no idea what his circumstances were prior to this. He is a very friendly and sociable chap. He tends to prefer the company of dogs of a similar size to him. He is also suitable to live with sensible teenagers. 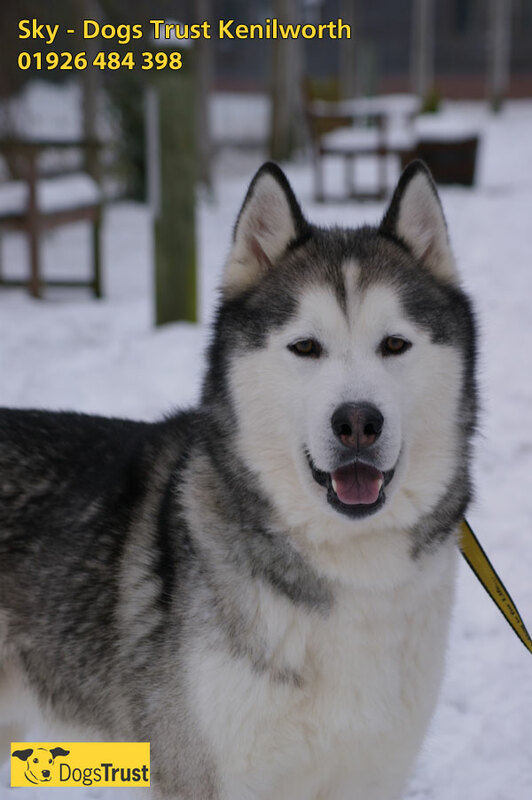 Sky is a 2yr old Siberian husky. He came into the centre beginning of the year. The only information that came with him stated he was unwanted. Sky is a headstrong, playful young dog in need of a stable active home where he has the opportunity to express himself in the right way. 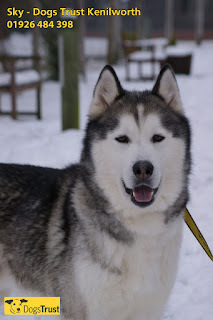 He is good with other dogs and is suitable to live with children not much younger than 8yrs old. Remember, you don't need an appointment to visit during opening hours (12noon - 4pm every day except Fridays), but you can give us a ring on 01926 484 398 if you have any questions. We hope to welcome you to the centre soon!